What does the roughly Rs6 trillion or 60% of the Rs10 trillion bad loan stockpile of banks as of December 2016 that stem from corporate borrowers say about the credit culture of Indian corporates? True, not all companies can be painted with the same brush. But there is a strong sense that most Indian companies have got off without paying what they owe to their lenders. Kingfisher Airlines and Winsome Diamonds reflect this. The roots of this problem emerge from the corporate debt restructuring (CDR) mechanism that was introduced with honest intentions of helping ailing borrowers in 2001. Several restructuring mechanisms introduced thereafter haven’t fared well either. In all fairness, corporates have been victims of political gridlock that jammed decision making on key legal permits to conduct business for over five years. Add to this the slowdown in the economy. But the thing about bad habits is that they emerge from weak circumstances but are hard to kick when things get better. So, companies that stopped paying banks due to the economic slowdown or government apathy didn’t start to do so when problems were resolved. Chart one on wilful defaulters is the unvarnished truth on how many companies got away with non-payment. 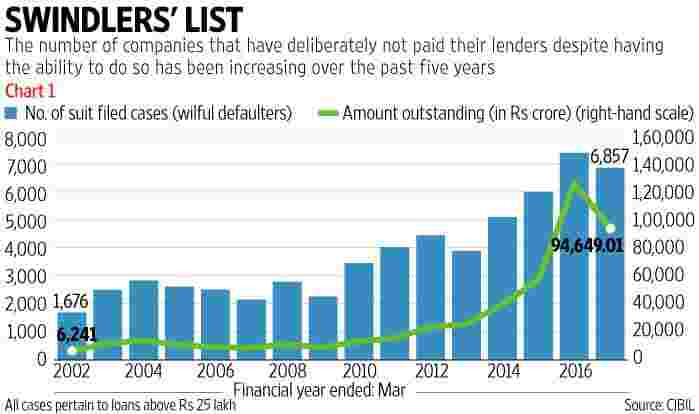 Look at the rise of the outstanding credit to wilful defaulters as well as the jump in the number of companies labelled as one between 2012-13 and 2015-16. This has reduced in 2016-17, perhaps as the Reserve Bank of India (RBI) encouraged banks to go after errant borrowers. But as of March this year, 6,857 companies wilfully defaulted on loans aggregating Rs94,649 crore. And these are only companies against whom cases were filed in court. There are many companies that are already labelled as wilful defaulters in the banks’ books but cases are yet to be filed. Another indicator that raises serious doubts over corporate credit culture is how much dues banks were able to recover over the past years. Charts two and three show how successful banks have been getting back their money. Between FY13 and FY16, banks recovered and upgraded loans totalling about Rs3 trillion through various means, but they wrote off Rs2 trillion and a lion’s share of these are corporate loans. 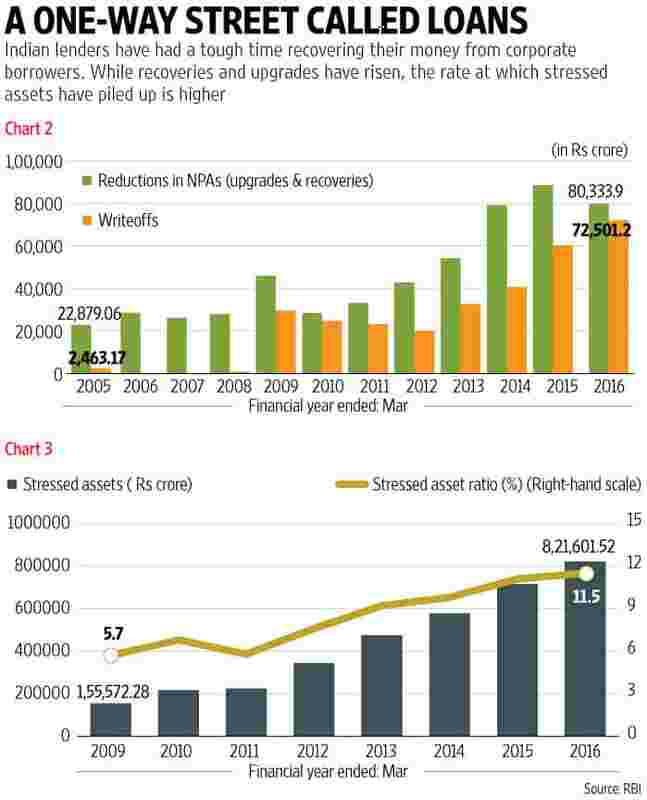 During the same period, banks saw their stressed assets balloon to a colossal Rs8.5 trillion and of this pile, close to Rs3.5 trillion was from companies. Granted, recoveries and upgrades are rising and write-offs need not mean the borrower and the loan is forgotten by the bank. Technical write-offs mean that bank branches still pursue the borrower as the asset is still on the books at the branch level. But recoveries from written-off accounts of the past are hard to come by. The pace at which companies are turning defaulters is far higher than the pace at which they are bouncing back to being regular re-payers. It remains to be seen whether—with additional powers for the RBI—the financial sector will go hammer and tongs after the manufacturers to instil some discipline. But no one can disagree that corporates need to vastly improve their credit culture.